The proposed law that would be applied to candidates of general category irrespective of religion was passed in Lok Sabha on Tuesday. Union Minister Thawar Chand Gehlot today tabled in Rajya Sabha a bill that will provide 10 per cent reservation in jobs and education to economically backward sections of the society. The proposed law that would be applicable to candidates of general category irrespective of religion was passed in Lok Sabha on Tuesday. During the debate, Mr Gehlot said the bill will uplift the poor. The decision has been taken after thorough consideration, he added. As the minister was speaking on the bill, the opposition came into the well of the house and raised slogans. Amid uproar, the house was adjourned till 2 pm. Earlier today, Lalu Yadav's RJD said that it would vote against the bill in Rajya Sabha. Aam Aadmi Party's Sanjay Singh said there were many contradictions in the bill and his party would think about supporting it after the government answered its questions. 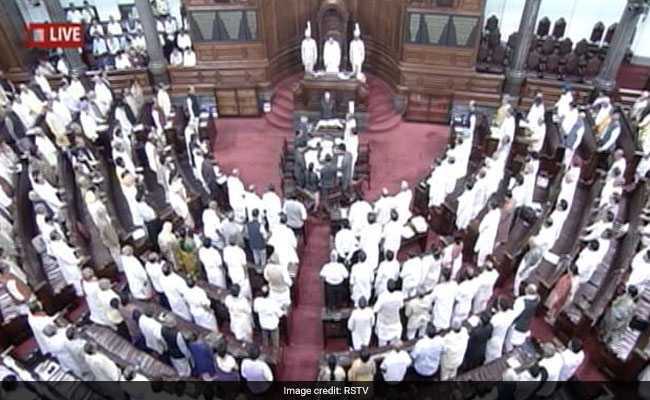 323 lawmakers voted in favour of the bill in Lok Sabha, whereas only three voted against it. Several of the opposition parties, including Lalu Yadav's Rashtriya Janata Dal, Arvind Kejriwal's Aam Aadmi Party and the Congress, questioned timing of the bill, claiming the government's move was spurred by the coming national elections. Among the opposition parties, the Samajwadi Party, Telangana Rashtra Samithi, Trinamool Congress, the Left and the Congress supported the bill in Lok Sabha.The proposed law also got the support of Telangana Rashtra Samithi, Naveen Patnaik's Biju Janata Dal and Upendra Kushwaha. Asaduddin Owaisi's AIMIM had opposed the bill. Tamil Nadu's ruling AIADMK walked out of the house ahead of the voting. "The passage of The Constitution (One Hundred And Twenty-Fourth Amendment) Bill, 2019 in the Lok Sabha is a landmark moment in our nation's history," PM Modi said after the bill was passed in Lok Sabha.